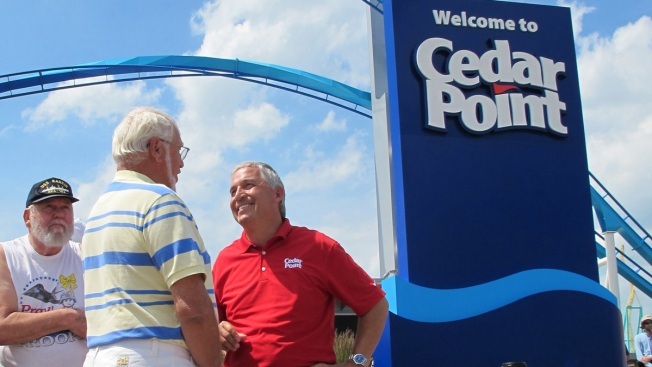 In this July 2, 2014, file photo, Matt Ouimet, chief executive of Cedar Fair Entertainment Co., greets a guest at Cedar Point amusement park, in Sandusky, Ohio. An amusement park in Ohio lost power Monday, shutting down rides and stranding visitors in mid-air on roller coasters. Around 1:45 p.m. local time, Cedar Point, "the roller coaster capital of the world" tweeted that it had lost power in a portion of the park and that Ohio Edison was addressing the problem. Visitors to the park shared images on social media that showed a roller coaster stuck on a steep ascent and smoke emanating from the platform of the Sky Ride. "Spent $1200 between fast passes and admission for 6 people ... thanks for nothing," one person tweeted. About two yours later, Cedar Point tweeted that power had been restored and rides were opening as soon as possible. No word has been given as to what caused the outages.